Throughout the world, there is a growing need for integral water solutions. We need protection from excess water in order to live safely in delta areas and river basins. Our water systems also need to be clean and sustainable. To support water authorities, consultancy firms, research institutes and universities worldwide, Deltares offers an integrated 1D/2D modelling suite called SOBEK for integral water solutions. SOBEK is a powerful modelling suite for flood forecasting, optimization of drainage systems, control of irrigation systems, sewer overflow design, river morphology, salt intrusion and surface water quality. The modules within the SOBEK modelling suite simulate the complex flows and the water related processes in almost any system. The modules represent phenomena and physical processes in an accurate way in one-dimensional (1D) network systems and on two-dimensional (2D) horizontal grids. It is the ideal tool for guiding the designer in making optimum use of resources. SOBEK has been developed jointly with Dutch public institutes and governmental organisations, research institutes, universities and private consultants all over the world. SOBEK offers one software environment for the simulation of all management problems in the areas of river and estuarine systems, drainage and irrigation systems and waste water and storm water systems. This allows for combinations of flow in closed conduits, open channels, rivers overland flows, as well as a variety of hydraulic, hydrological and environmental processes. The hydrodynamic 1D/2D simulation engine is the computational core of SOBEK. This engine allows the combined simulation of pipe, river-, channel- and overland flow through an implicit coupling of 1D and 2D flow equations. 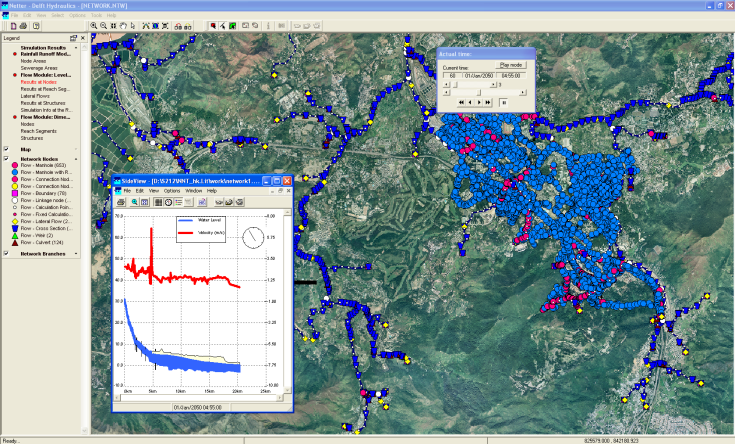 SOBEK is the ideal tool for studying the effects of dam breaks, river floods, dike breaches, urban flooding etc. The hydrodynamic 1D/2D simulation engine is equipped with a very robust scheme for numerical computation. It also guarantees mass conservation, even in case of transitions through suddenly varying cross section shapes. The engine combines computations of subcritical and supercritical flow, at scales selected by the user. It handles flooding and drying of channels without the use of artificial methods such as the Preissmann slot. The hydrodynamic 1D/2D simulation engine has a very efficient numerical solution algorithm. The algorithm is based upon the optimum combination of a minimum connection search direct solver and the conjugate gradient method. It also applies a variable time step selector, which suppresses the waste of computational time wherever this is feasible. The size of the model is only limited by the size of the internal memory of the computer used. 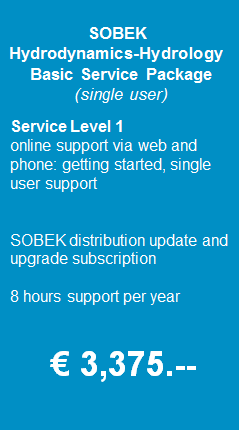 The latest fully validated SOBEK Suite is version 2.16.003. This version is available via our SOBEK Service Packages. You can easily order these products via software@deltares.nl and then download the software via our Download portal. SOBEK functionality is being integrated in the Delft3D Flexible Mesh Suite. You can read more about it here. The validation of a modelling system such as SOBEK and Delft3D FM requires continuous attention. Even though the individual modules of the suite have been thoroughly tested during their development, the suite as a whole requires intensive testing and validation too. To this end, a regular programme is established and tests of many of the most likely combinations are continually performed. As a policy, new versions are released only after an extensive beta testing period, to ensure that our users are only provided with stable and validated products. SOBEK allows you to simulate the interaction of water and water related processes in time and space. The suite is mostly used for the modelling of integrated water systems for water management, design, planning and policy making. SOBEK consists of a number of well-tested and validated modules, which are linked to and integrated with one-another. These modules are listed below. Deltares offers high quality services to consultancy firms, governmental organizations, research institutes and universities worldwide. 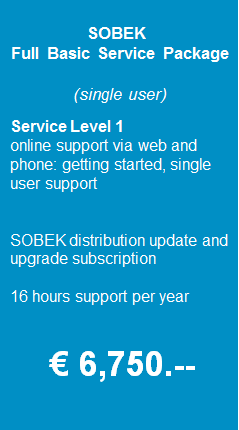 Several SOBEK service packages, including fully validated high quality SOBEK distributions, are available to suit your specific needs! Maintenance and support is included in our SOBEK service packages. Please check the service packages tab for the package that suits your specific needs. 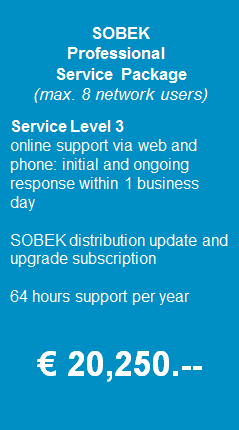 The SOBEK support desk is the user’s instantly accessible contact point for all questions and problems concerning the software. The support team answers the majority of questions instantly or takes responsibility that a timely reply is given by one of the other SOBEK team members. All incoming queries on the software packages, current or future performance, are recorded in our issue tracker system. This system is an important instrument in the realization of improvements to the package, the manuals and the Deltares Academy training courses. If you have questions about purchasing the software, please contact our Sales Service team. For any of your software technical questions our Support team is happy to help you. · The software is delivered with a manual, including Getting Started and Tutorials. *SOBEK is a stand-alone application and is not designed to run as a multi-user application in a Remote Desktop Services environment or similar environments. Solution for problem: Incorrect results in case Y-Z profiles and/or Asymmetrical trapezium profiles are used in combination with Bos & Bijkerk friction type anywhere in a model. Description: in case the Bos & Bijkerk friction type is used anywhere in a model schematisation, the computational core should not switch off the vertically segmented conveyance method applied for all Y-Z profiles and Asymmetrical trapezium profiles, even if another friction formulation is used at such profile. In SOBEK 2.12.003 the algorithm of the PID controller has been improved. For some models this might result in computational differences. Clients using models with PID controllers are advised to verify if computational differences between SOBEK 2.12.003 and previous SOBEK versions are acceptable. In case these differences are not acceptable, the gain factors (K p, K i, K d) of the PID controller in SOBEK 2.12.003 need to be retuned.